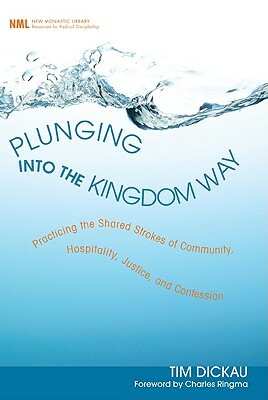 This book is one to love: Plunging Into the Kingdom Way by Tim Dickau (Cascade Books, 2011). First of all, it's about a church in Vancouver. Enough said. Worth the read right there. As our years in Vancouver made us aware, nothing about that city could ever be uninteresting. Second of all, Charles Ringma wrote a foreward that alone makes the purchase of the book worth the price. Third of all, Tim Dickau writes as a pastor who actually has been and is and continues to be practicing what he writes. I love that. Tim has served as a part of unique church in East Vancouver since 1989. During that time the church has transitioned from a sincere but small and aging congregation to a dynamic community that challenges the North American understandings of "church". This is not a book for the faint of heart. Neither is this a book for those that want to continue to "go" to church. I'm challenged… and admit that I had to simmer on each page in order to let the implications of a practiced Christianity sink in. It's just not that easy for a comfortable North American to move into a lifestyle of "radical hospitality" or to step out of homegeneity into a "shared life among cultures". These, and the two other major themes of the book ("Justice for the least" and "repentance") are practices I long for… but they can be incredibly difficult to endure. A church can do it, though. And the world needs churches to practice better faith. This book is not a blueprint or a cookie-cutter model by any means… it is the story of a congregation that decided and acted to intentionally live out the Gospel in their neighborhood. Thank you Grandview Calvary Baptist Church for your example and encouragement to the rest of us!